With over 30K students across 3 campuses (located in Corvallis and Bend, Oregon, as well as an online campus), finding the right tool to tackle campus-wide issues can be a challenge. With 98% of Gen-Z owning smartphones and spending approximately 4 hours a day on their devices, OSU decided that implementing an inter-campus mobile platform would be the most effective tool to attain these objectives. Another positive side-effect of implementing a mobile communication strategy was to refresh the face of their campus, making it more Gen-Z friendly. Probably unsurprisingly, Oregon State’s online campus is the fastest growing institution of the 3, serving the unique requirements of today’s students. One compelling example of this shift in student-learning is how information is currently being accessed. 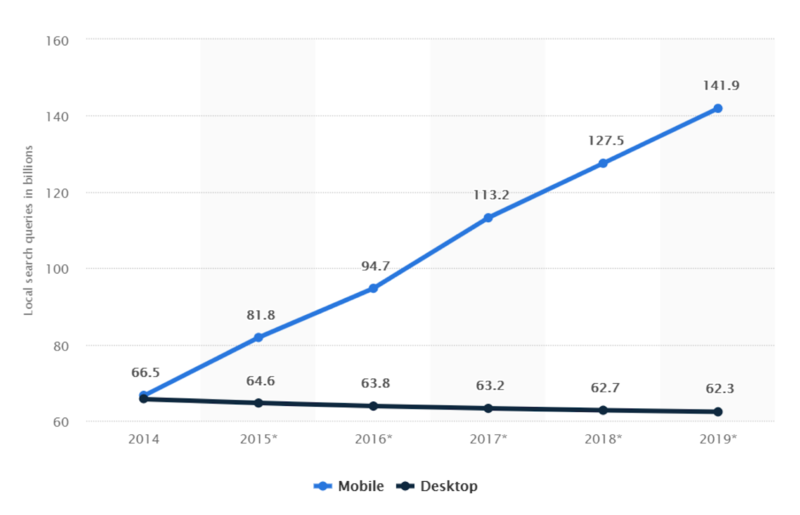 The above graph shows a 5 year trend in search queries on mobile and on desktops. As you can see, the number of queries on mobile have skyrocketed while those on desktop have decreased. When a student wants to research a course subject, find a restaurant or buy a pair of headphones, the first thing they will do is pull out their mobile devices and google it. Therefore, it’s extremely important to realize that the relationship between young adults and information has changed, and that students are bringing this new relationship with them when they arrive on campus. Once OSU decided that a mobile communication platform would be the right strategy for them, they needed to find an app that could integrate with their pre-existing systems, including Banner (SIS), and Canvas (LMS). After considering building their app in-house, OSU decided that it would take too much staff-time and resources, and would most likely be neglected or overlooked after its launch. Typically when a mobile platform is being launched, people are excited and motivated. However, once the initial enthusiasm wears-off and priorities change, institutions oftentimes end up with a resource that isn't being updated regularly. Because an institution’s mobile platform is one of the first things students see when they arrive on campus (and sometimes before! ), having an external vendor build the tool ensures that it will remain up to date. According to Ed Lee, the benefits of going with an external vendor include not having to worry about the app being maintained, and would also require fewer resources since the price of developing the app would be spread across all of the vendors’ partners. Similarly, by outsourcing app-development to a tried-and-tested 3rd party, a campus can be confident that their pre-existing systems will be able to integrate seamlessly and without issue. When asked why OSU chose Ready instead of the other mobile platform vendors, Ed Lee said that Ready’s ability to integrate with an institutions pre-existing systems was the deciding factor; OSU needed a vendor who could integrate with their emergency alert system “out of the box.” Because of Ready Education’s (formerly DubLabs) superior integration capabilities, OSU was confident that their Newsfeed, LMS integrations, and SIS integrations could be easily incorporated into the app as well, with little to no headache. Having the app be branded to the institution was also a big concern for OSU; they didn’t want a generic app or an app that was branded to the vendor. The OSU brand needed to be front and center. In order to get the project started, OSU created a digital experience advisory group, as well as a student focus group to determine what exactly would benefit the campus most in terms of a mobile communication strategy. OSU conducted a soft-launch of their app in March 2017, only promoting it to faculty and staff, yet as you can see in the above graph, students still found the app. The hard-launch occurred in the fall of 2017, and saw close to 7K downloads in September through simple promotional materials such as flyers. Today, OSU has had over 30K app downloads. The above graph shows the number of app visits from the soft launch, to February 2019. In the month of September 2017 (hard-launch), OSU had 157K+ app visits, and by September 2018, that number more than doubled to 318K+ visits. What these numbers demonstrate is that the content within the app is relevant to students, since they continue to return multiple times a month. One example Ed Lee gave to highlight the app’s usefulness was when his son could not find a class, and used the platform to navigate campus. By giving students a tool that is intuitive, personalized, useful and easy to use, Oregon State University is not only building a mobile campus community, but also enhancing the student experience, and reducing stress. To watch the full webinar, click here.